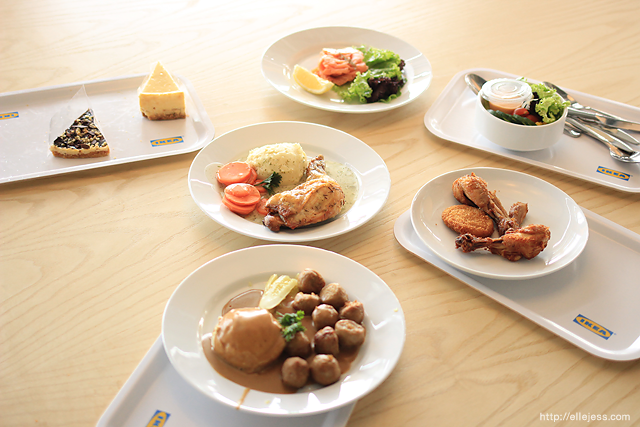 OMG can we just say that we’re sooooooo excited that IKEA finally opens its FIRST. STORE. EVER in Indonesia?? That means we don’t have to go to Singapore or anywhere else to shop their awesome stuffs again! 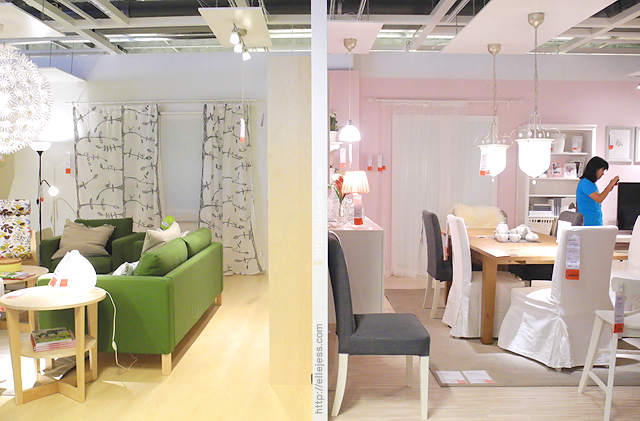 Okay, why we love IKEA, you asked. 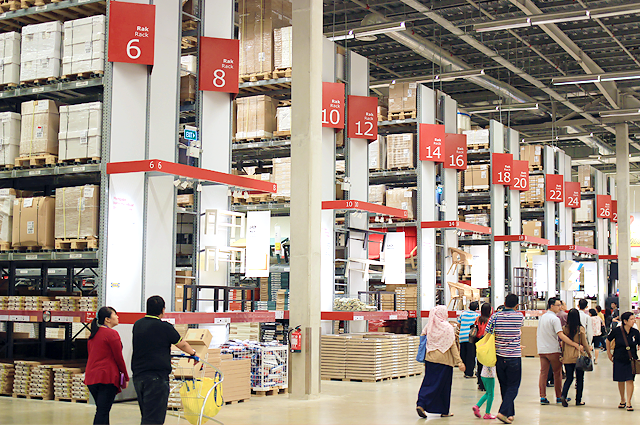 Located at Alam Sutera – Tangerang (a tad bit outside Jakarta), this world’s largest furniture retailer originated from Swedish established its first Indonesian branch on a 33,000 square-meter property. It’s reaaaally large and spacious! 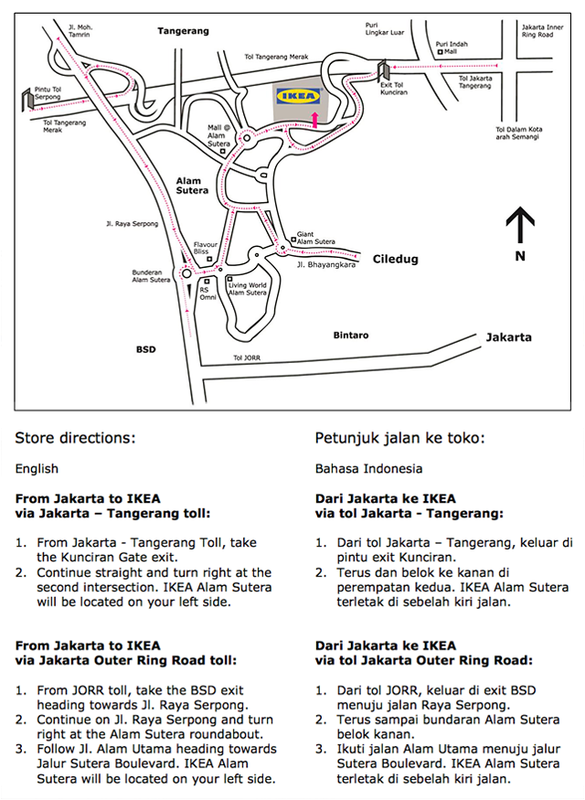 IKEA opens daily from 10 AM to 10 PM. Breakfast is also available from 09:30 AM! 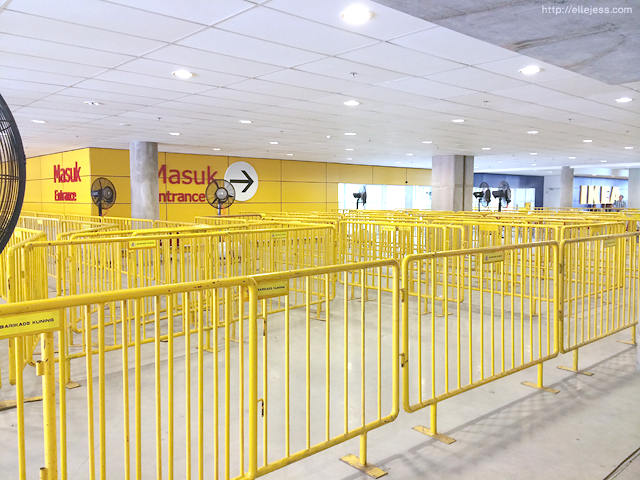 The parking lot itself has over 1000 basement and outdoor free parking spaces, but on the opening day last Wednesday -October 15th, 2014, it was overflowed that guests had to park their cars at Mall Alam Sutera and rode a bus to get back to IKEA (the bus was provided by IKEA as well) haha. 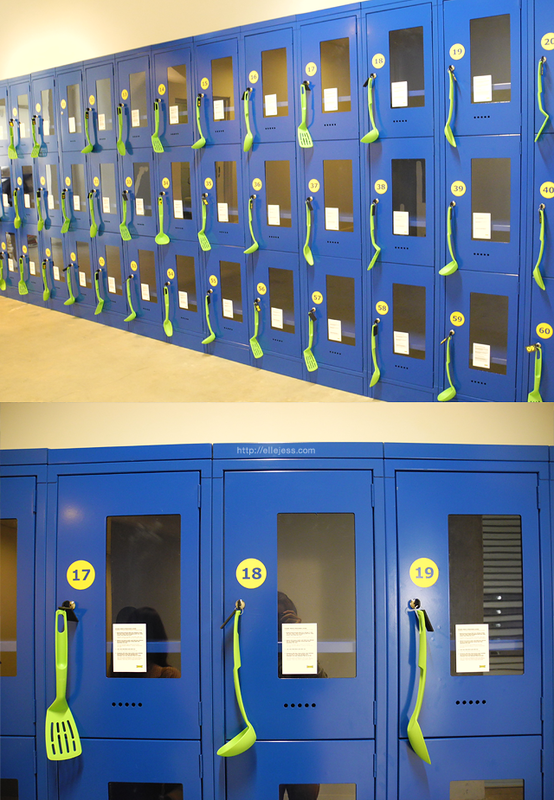 Next thing you’ll see *if you’re going to a toilet first, like we did* is this row of vibrant blue lockers, equipped with cute neon green kitchen utensils as the keychain. Customers can put their belongings here if they wish to lighten up before going into the store, because boy, it would be a long ride before they reach the exit. 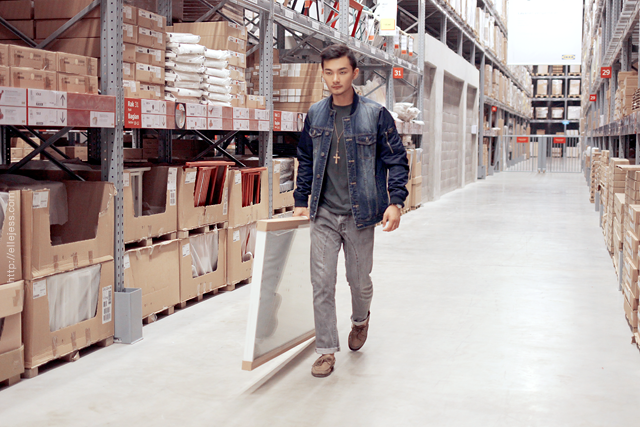 This brings us to our first tip on visiting IKEA: wear comfortable shoes. Period. 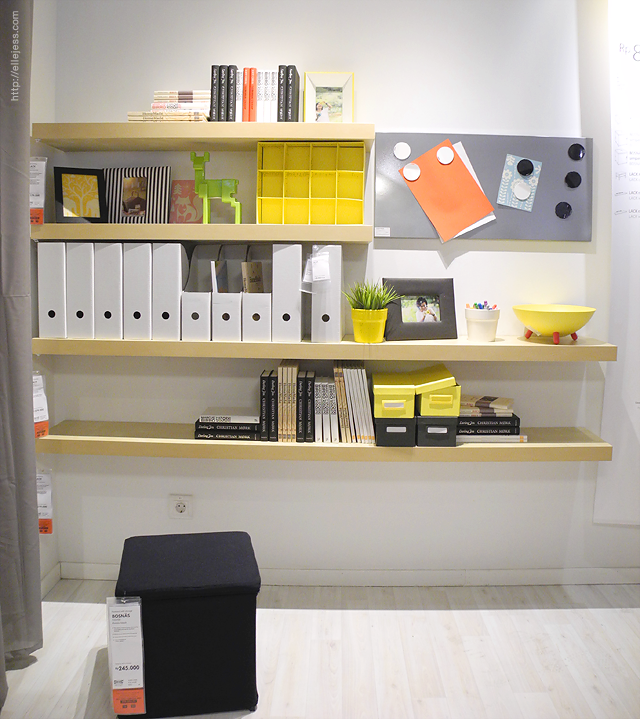 IKEA’s creative, pleasant-on-the-eyes displays show us that even small houses or apartments can accommodate a bunch of stuffs while still looking good and comfortable to live in. They use even the smallest space efficiently, which makes us wonder, “How come I never thought of this before?”. 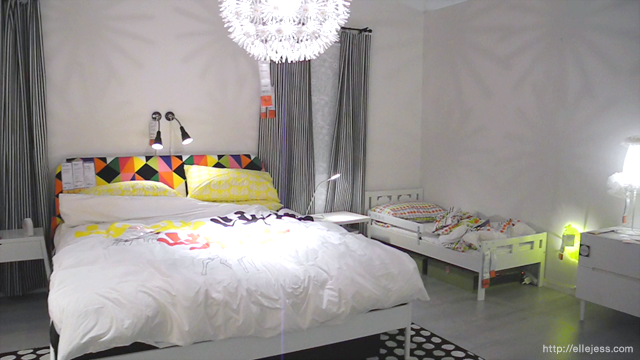 Modern family bedroom. Love how the pretty lamp makes up the room’s ambience. 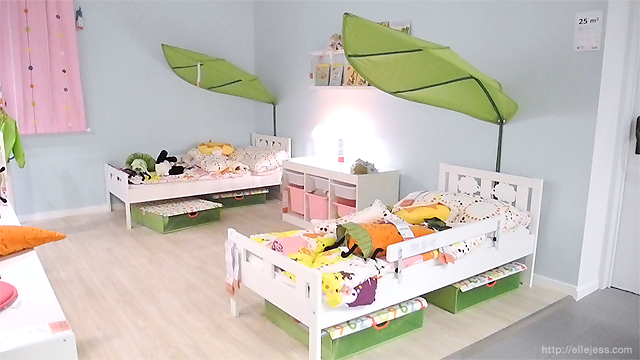 Oh, if only we had a room like this when we were kids. Can’t imagine how more lively and adventurous our playtime would be! Whatta cute kitchen! Too bad we don’t cook lol. Jess was taking a selfie when suddenly, out of nowhere, Clara hushed and called her name lol so embarrassing!!!!!!! Aside from how much they invest on the showrooms (such large space could actually be used for storing more things, right? 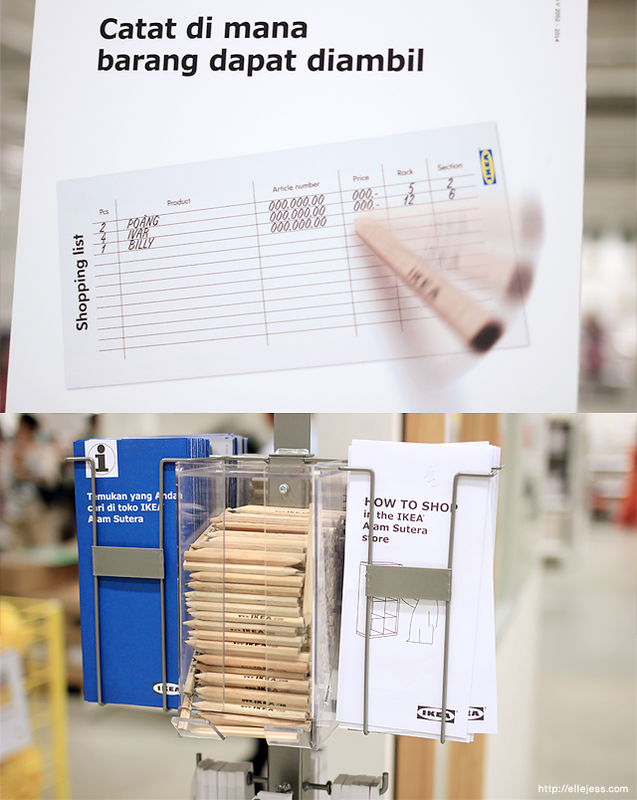 Instead, they spend money and time decorating those beautiful showrooms which, oh well, cleverly trigger our needs to buy the stuffs on display anyway lol), IKEA also have some other house rules which allows them to put cheaper price tags than what it should be. See those brown boxes up there? They consist our newly bought cabinet, standing lamp, etc. 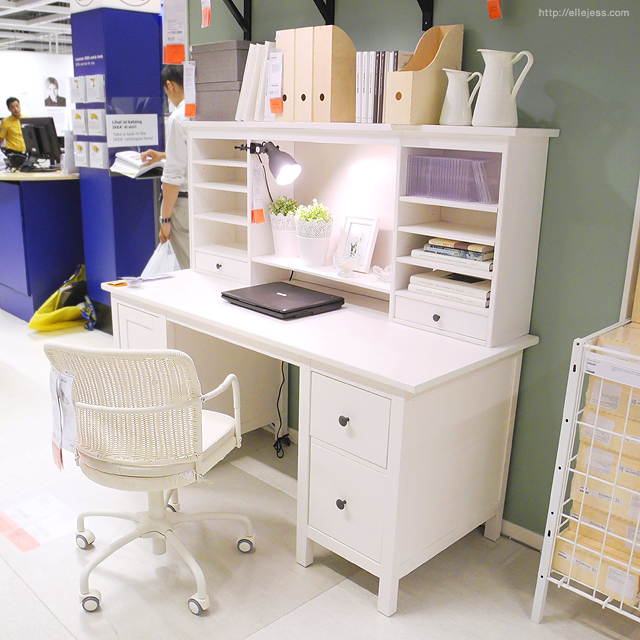 and it is one of many ways to save money which is applied by IKEA; by flat-packing the furnitures which make them easier to store and transport. Customers bring their furnitures home themselves instead of using a ‘free delivery service’ already included in the price AND assemble the furnitures themselves, too, instead of paying someone to do it. 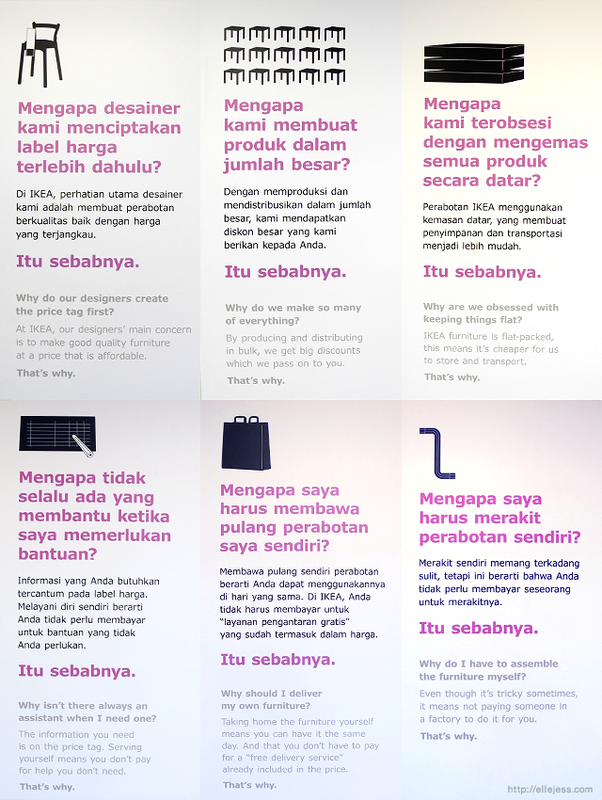 As you can see, IKEA applies ‘independent ways’ of shopping, which is considerably new in Indonesia (yes, we’re kinda spoiled and accustomed to being served haha). 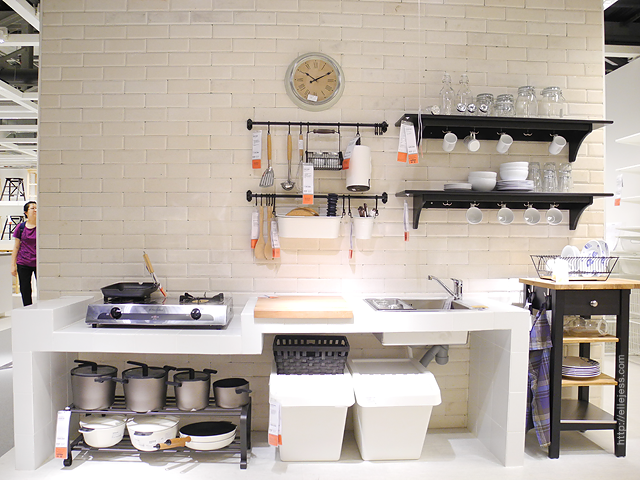 Anyway, despite all the do-it-yourself stuffs, delivery service is still available here, starting as low as IDR 280,000. Assembly service is also available here for 8.5% of the product’s price or more. The famous Swedish Meatballs and friends! Although there’s no Lingonberry Sauce on the meatballs yet, it still tastes good enough for random nomming. The Salad is really fresh as well, but our favorite is the salmon sashimi and… the BROWNIES (which is not in the picture ahaha)!!!!! Okay, we strongly suggest you watch the video because it shows this part (the cafeteria) a lot better. We were so busy filming (and eating) that we forgot to take pictures! 1. Grab one of the pencils and one of the blue brochure (there’s an empty note behind it). They will serve as your shopping list. 2. 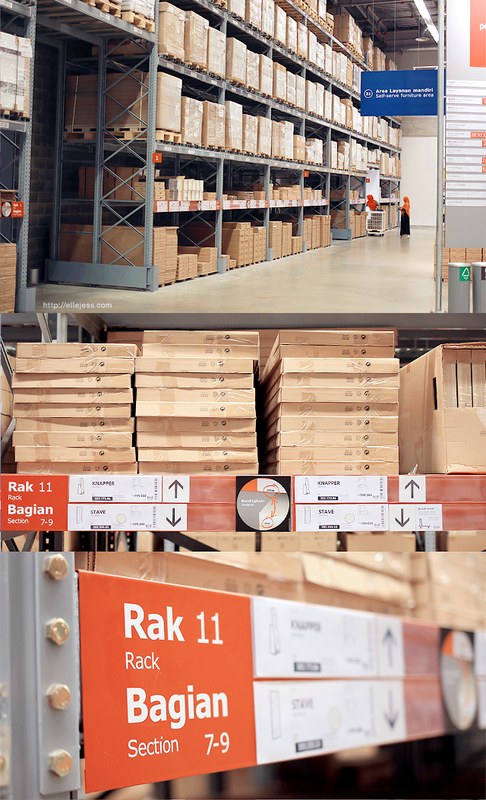 As you can see, each large display item has a price tag on it (Rp 999.000) and “Area Layanan Mandiri” tag which shows WHERE you can pick it up in the self-serve furniture area–the rack and section number of the item. WRITE that down on your shopping list! That looks so fun!!! 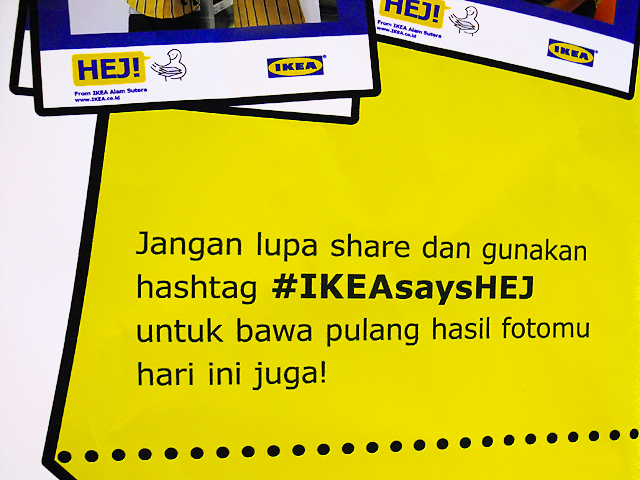 I wish I was in Indonesia right now (just visit IKEA_ID? XDD) That corner desk is definitely super cute! Never thought about that before…. kalap dan berharap punya apartemen kosong (and unlimited money) to actually buy all those cute things !!! 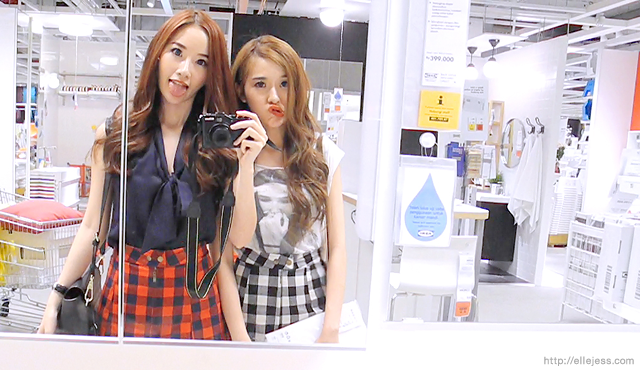 Awesome video and beautiful pictures, I love IKEA. Australia just got it's first ever FOREVER 21, I just posted about it. New stores are so exciting! The Indonesian pricing is quite ridiculous tho, it's 3-5 times the pricing in Singapore and even Berlin where I live. I just bought that Stave mirror set for 60 euro in total, compare that to the Indonesian price which is around 1.5 mills rup. thank you ci reviewnya. it helps me a lot. pengen kesana tapi masih rame banget kayaknya. What a fun trip! Makes me wanna shop there, too 🙂 nice review, elle jess! kemejanya Elle yang kotak2 itu will be avail in gowigasa or from other brand? 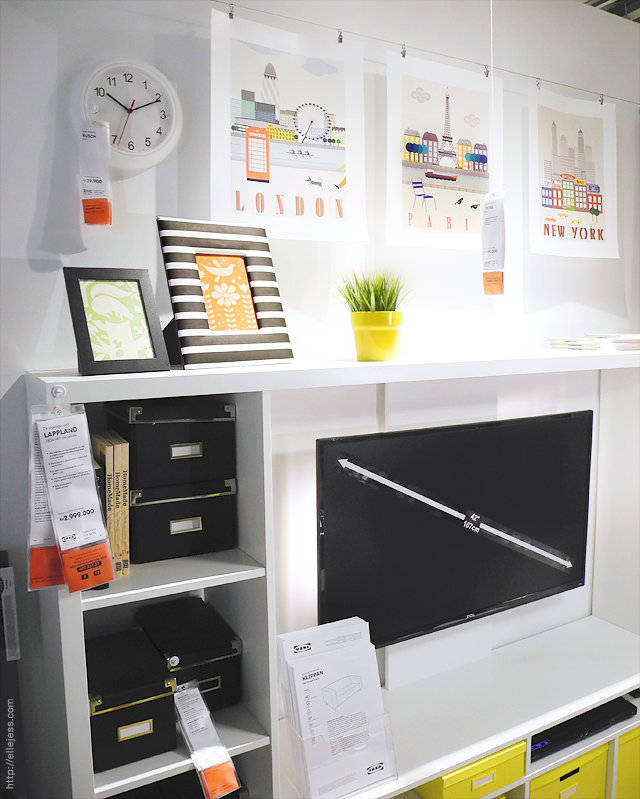 I would love to have an IKEA store where I live. I love the lockers! You 2 look amazing as always!!! Did you know you can create short urls with AdFly and make money from every visit to your shortened urls.